Born: Abt.1807 in Harwich Ma. 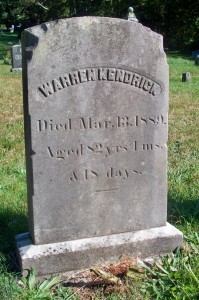 Died: March 13, 1889 in Pocasset Ma. at 82 yrs, 4 mos, 18 d.
Married: May 13, 1827 in Harwich Ma. 1. Delilah Ophelia Kendrick Wing; (October 8, 1827 – November 26, 1910); Married Oliver Cromwell Wing (1826 – 1895) (William Wing & Mary (–)) in Pocasset Ma. on May 29, 1850; They had 9 children; Delilah & Oliver are buried in Cataumet Cemetery. 2. Cynthia S. Kendrick Stetson; (January 8, 1830 – October 16, 1904); Married Henry D. Stetson (Abt.1827 – 1882) (Matthew Stetson & Fanny (–)) in New Bedford Ma. on July 2, 1854; Cynthia is buried in Riverside Cemetery in Fairhaven Ma..
3. Eliza Ann W. Kendrick; (August 2, 1834 – October 18, 1844); Eliza died at 11 yrs, 2 mos, 15 d..
4. 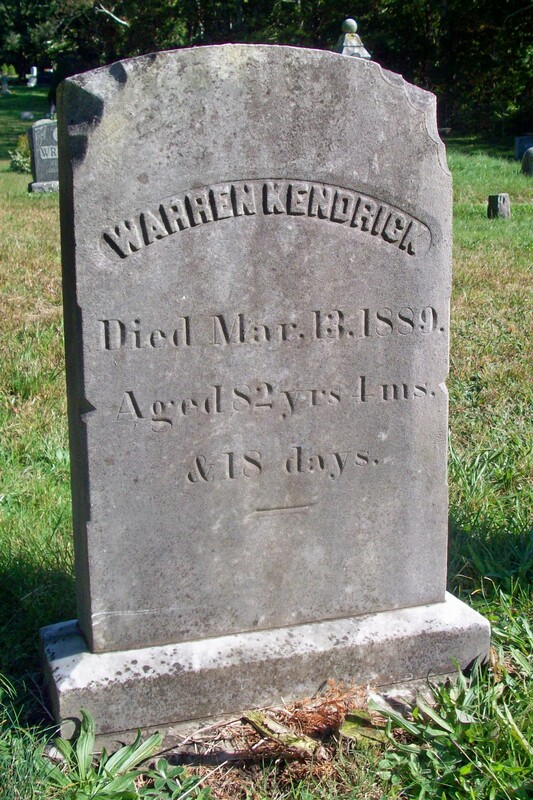 Warren Kendrick, Jr.; (May 31, 1837 – July 6, 1925); Married Mary Frances Westgate (1839 – 1914) (Frederick Westgate & Patience Bourne (Adams)) in Sandwich Ma. 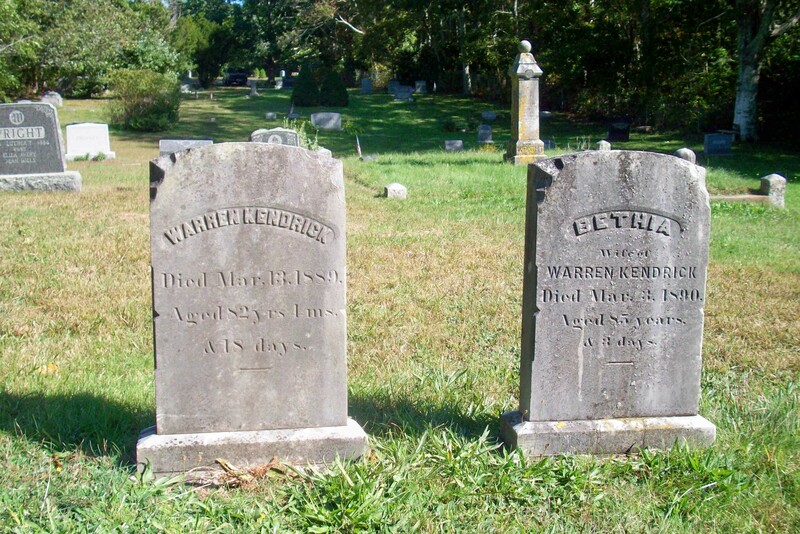 on November 29, 1863; Warren, Jr. & Mary are buried in Pocasset Cemetery. 5. Bethia Kendrick; (September 5, 1839 – ? ); Bethia is assumed to have died young; Another child was named Bethia in 1844. 6. Bethia A. Kendrick Ricketson; (November 23, 1844 – November 15, 1913); Married George P. Ricketson (1838 – 1902) (Resolved Ricketson & Lydia Kelley) in New Bedford Ma. on May 11, 1859. 7. Freeman Berry Kendrick; (1845 – February 17, 1909); Married Isabell Frances Raymond (1845 – 1912) (Ebenezer Raymond, Jr. & Catherine Adams) in Sandwich Ma. on January 14, 1867; Freeman & Isabell are buried in Pocasset Cemetery. 8. Charles Everett Kendrick; (1846 – September 24, 1920); Married Adeline/Addie Raymond (1847 – 1941) (Asa Raymond & Eliza Ann Lumbert) in Sandwich Ma. on January 12, 1868; Charles & Adeline/Addie are buried in Pocasset Cemetery. 9. Elvira C. Kendrick Pierce; (April 24, 1848 – ? ); Married Austin Leslie Pierce (1849 – 1940) (John Pierce & Martha Lovell) in New Bedford Ma. on November 23, 1871.